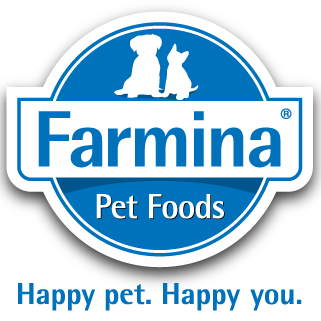 Farmina Natural & Delicious (N&D) is an Italian product designed and developed to be naturally appropriate to the metabolism and palatability of dogs & cats. Farmina provides quality formulas which promote health and address concerns, such as obesity and diabetes. Farmina is a family-owned company that takes the business of pet food very seriously. Transparency and honesty is a priority for the Russo family. Farmina is proud to have combined the bounty of excellent ingredients available in Italy with cutting edge research & technology in order to make their finished foods safer and better for your pet. Low Glycemic Index with minimal carbohydrates . High protein sources from high quality fresh meat. Vitamins & minerals in proper balance from high quality fresh fruits & vegetables. Medicinal plants with specific properties for targeted effects. Complete absence of complex cereals or small amounts of GMO-free ancestral cereals. 40% Fruits, minerals and vegetables. 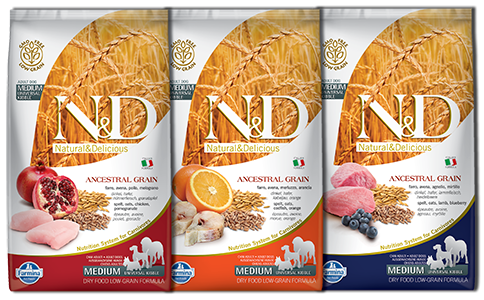 20% Gluten & GMO-Free Ancestral cereals. Ask for Farmina Natural & Delicious at your favorite Northland Retailer. Review: Dogs couldn’t get enough, got excited every time the bag came out. Review: This is the best food I’ve ever fed my dogs! The scent of the food is more like a meaty dinner than a typical processed dry dog food, and it seemed like my dog agreed. She could hardly contain herself at dinner time! No ”suspect” ingredients or potential allergens for my dog. I would highly recommend this food to maintain a healthy dog! Review: I’ve been using this as primarily training treats & the Beagles love it – they are willing to work for it. Review: My 2 year old Standard Poodle enjoyed his food. Will continue to buy. Review: This dog food is great, and our dogs loved it. It was more fragrant that some other foods we have tried, and this enticed the dogs to come running to their bowls. I like that the ingredients are never frozen and that there is a nice balance of fruits, vegetables and meat in the kibble. Our senior female is very picky and has a sensitive tummy. She couldn’t wait for us to feed her this kibble. The size and shape of the kibble was great, too. The senior would crunch away, and I knew that not only was she getting great quality food, she was helping her teeth and gums in the process. Our 5 year-old male loved this kibble as well. This is a great kibble that I would gladly feed them again! Con: Too large of pieces for the size of dogs I have. I have both large and small dogs. Review: Wish the kibble was a smaller size because I have both large, medium, and small dogs. They really liked the taste of it! Low grain content. Used to feeding grain free food. Con: Is it made and exported from Italy? If so, how is it shipped to the USA? Boat? Review: Great product. More product is absorbed by the dog’s body, meaning less poo! Food that respects my dogs for the animals they are! 2 Benefits: my pickiest eater LOVES this food, and my beagle mix that lives for all things food doesn’t get too many carbs with this food, keeping weight in control! Con: I keep this food on hand at all times and keep the cost down by mixing it with other healthy kibble. Review: Natural & Delicious dry food for dogs is my new favorite food to give my dogs. There is not one unhealthy ingredient in this food. The texture is impressive to me; it is a dry food, but also has a moist quality to it, which helps one of my dogs that takes some time to chew his food. Grain free works best with both dogs, and this variety has hit the mark. Thanks for offering another great product. Review: My senior dog is losing weight due to not eating as much. Emmie Lou loves the smell and taste of the food, which encourages her to eat better than she was previous to introducing the new food. The Natural & Delicious food has turmeric in it which is an anti-inflammatory and is good for her arthritis. She really likes this food! Con: It is expensive, so I mix it with another brand to stretch it out. Review: Mabel really likes this food, She starts eating as I pour it into her bowl. It smells so good it could be mistaken for human food. I usually free feed, but with this food I can’t because she will keep eating to the point of overeating. I would recommend that everyone try this for their dog, if it fits into their budget. 2 Features: It smells like something a dog would love. 2 Benefits: Seems very fresh. Con: We decided to go with the low grain even though my dog usually eats grain free and his poops are really messy. I combine it with Fromm surf and turf. but think I think I might have better luck combining it with Solid Gold Sun Dancer. Will try that next. Con: The pellets are large but my Miniature Pincher, still eat it. A smaller kibble would make it easier for small dogs to eat. Review: My dogs cannot eat this food fast enough. I think they would eat the whole bag if they got a hold of it. It’s maintaining their weight and the have a lot of energy. 2 Benefits: My dogs are not picky. Con: Gave one of my dogs diarrhea. So I cut her back on the N&D food. Review: The dogs seemed to enjoy the food. Even my cats liked it. My dogs are on a raw dog food diet and this worked well to mix in with the raw food. Con: Expensive to feed my dogs. Omega 6 versus Omega 3 ratio is a surprise, I’m not certain its appropriate or better than its supposed to be. Review: I am not certain as to why this food is considered cruelty free. It’s hard to expect more protein from a kibble. It smells like food. It is unclear to my why a ”ancestral grain” would be better for my dogs. Wolves / dogs are greater omnivores than cats, but would still require a higher protein level. I like the convenience of kibble but am uncomfortable that it’s a healthy food choice. Thanks for your helpful feedback and comments. Here are answers to some the items you pointed out. Farmina’s Cruelty Free Commitment – We do not conduct laboratory tests on animals. Our research is aimed at proving the functionality of the products we make and is based on working with pet owners and their animals under normal conditions in their home environment. When we test foods, the dogs and cats eat the food in their homes surrounded by their loving family. Animal ingredients and protein – 60-70% of the ingredients are animal sources. This is 1.5 – 2.5 times higher than other premium pet food kibbles. All the N&D formulas provide 92-97% of the protein from animal ingredients, rather than plants, which would be considered more biologically appropriate for a dog. Omega 6 to 3 ratio- the formula you fed was: Omega-6 Fatty Acids* (min): 1.60%; Omega-3 Fatty Acids* (min): 2.30%. Other formulas in the line range from @ 2:1 – 3:1 Omega to 3 ratio. Over my years of working with foods, I have felt these ratios are great for improving health in pet. Review: Both of my dogs loved this food. They wanted to taste test it right away, and wanted more!